According to Christian fundamentalists, the Bible is an accurate historical record in its entirety, and this veracity is, in their opinion, due to the fact that Scripture was written under the guidance of God. In my opinion, this assumption is untenable because of the contradictions that are found within this allegedly inspired book, and I shall now proceed to demonstrate this fact (NOTE: all quotations are from the Revised Standard Version). So, how did Saul die? By his own hand, by the hand of an Amalekite, or did the Philistines kill him? So how did Judas die; from strangulation or disembowelment? Moreover, how did he purchase a field with "the reward of his wickedness" when he returned the pieces of silver? Suppose that you were reading the biography of President Abraham Lincoln (1861-1865), and on one page the author said that Lincoln committed suicide, on another that he was killed by a crazed actor then, further on, by a Sioux Indian. Kirk Straughen (Investigator 175) regards belief in the inerrancy of the Bible untenable because of alleged contradictions in the Bible. He gives as examples the deaths of King Saul and Judas Iscariot. Saul died after being defeated in a battle by Philistines. But who killed him? a) 1 Samuel 31:4 says, "So Saul took his own sword and fell upon it." "I happened to be on Mount Gilboa; and there was Saul leaning on his spear, while the chariots and the horsemen drew close to him. So I stood over him, and killed him, for I knew that he could not live after he had fallen…"
c) II Samuel 21:12 states, "the Philistines killed Saul on Gilboa." Archer (1982) reconciles "a" and "b" as follows: "In the light of the straightforward account in the previous chapter, we must conclude that the Amalekite was lying to gain a cordial welcome from David." Alternatively, when Saul "fell upon" his own sword he did not die immediately but stood up and supported himself on his spear while suffering "convulsions". The Amalekite then finished him off. 3. The Amalekite mercenary who finished Saul off may have been on the Philistine, not the Israeli, side. The standard answer to whether Judas hanged himself (Matthew 28:5) or got disembowelled (Acts 1:18) is both. Judas hanged himself and the rope or the branch of the tree broke, and the fall perhaps onto a rock spilled his guts. "Matthew does not deny that Judas, after hanging himself, fell and burst asunder; Peter does not assert that Judas did not hang himself previous to his fall. Probably the circumstances were much as follows : Judas suspended himself from a tree on the brink of the precipice overhanging the valley of Hinnom, and the limb or the rope giving way, he fell, and was mangled as described in Acts." When Judas, his betrayer, saw that Jesus was condemned, he repented and brought back the thirty pieces of silver to the chief priests and the elders. He said, "I have sinned by betraying innocent blood." But they said, "What is that to us? See to it yourself." But the chief priests, taking the pieces of silver, said, "It is not lawful to put them into the treasury, since they are blood money." After conferring together, they used them to buy the potter's field as a place to bury foreigners. Now this man [Judas] acquired a field with the reward of his wickedness; and falling headlong, he burst open in the middle and all his bowels gushed out. 2. The priests refused to accept the money back, but Judas by throwing it down in the temple authorized the priests to decide what to do with it. Their decision to buy the field was therefore Judas' decision by proxy. 3. We need to distinguish the words "purchase" and "acquire". Acts 1:18 in the NRSV Bible says "Now this man acquired a field…" whereas the King James Bible says "Now this man purchased a field…"
Correct is "acquire". In Acts 1:18 the Greek word is ktaomai which occurs seven times in the New Testament and means "acquire", "possess", or "obtain". In Matthew 27:7 where the priests bought the field the Greek word is agorazo which occurs 31 times in the New Testament and means to buy or purchase. The priests "purchased" the field but Judas posthumously "acquired" it because the priests had acted on his behalf. If the field was also the field where Judas was buried then he also "acquired" it in that sense, in which case Peter in Acts 1:18 is being ironic. Why was the field called "Field of Blood"? Acts 1:19 suggests that the field was named "Field of Blood" because Judas killed himself there. The reason given in Matthew 27:8 seems ambiguous. Either the field was the "Field of Blood" because it was "a place to bury foreigners" or it was the "Field of Blood" because of the series of events from Jesus' betrayal, to Judas' hanging, to the use of the field as a burial place. Acts 1:19 explains why the field was named "field of blood" soon after Judas died. Matthew 27, in contrast, looks back to Judas' death decades later as indicated by the phrase "to this day" — "For this reason that field has been called the Field of Blood to this day." Thus, the initial reason for the name "Field of blood" was that Judas killed himself there. But as decades passed another reason either was added to the first reason or replaced it. I therefore checked Wikipedia for the price of land in the first century and whether thirty shekels of silver would have covered it, but failed to find the answer. PROOF OF THE BIBLE / THE BIBLE PROVED? Most people who believe in "the inerrancy of the Bible" believe it as a doctrine, an assumption, not provable, acceptable only on faith. My approach is different. I check the Bible point by point including its statements on biology, history, astronomy, zoology, botany, medicine, ethics, psychology, genetics, geography and geology, besides investigating the Bible for contradictions. If a foundation of biblical statements that have been proved correct can be established, and any seeming errors and contradictions answered, it then becomes rational to infer that the original Scriptures were "inerrant". concerning the deaths of Saul and Judas. I will now proceed to examine his solutions in an attempt to determine their veracity. Anonymous makes a number of claims in an attempt to account for the discrepancies surrounding the death of Saul. One of his claims is that the Amalekite lied to gain a cordial welcome. Unfortunately, no sound evidence is given that the conversation took place or that the Amalekite was deceptive in his account of events. The claim must remain unproven due to its speculative nature and lack of supporting proofs. Another of his claims is that although Saul fell on his sword the wound was not fatal, that he stood up and that the Amalekite administered the coup de grace. However, before we can attempt to determine veracity of this claim it will be helpful to consider how one might commit suicide by falling on one's sword. Assuming events are true Saul would likely have wanted a quick death, and one way to achieve this would have been for him to place the tip of the sword over his heart whilst holding it with both hands, and then fall forward in such a manner that the pommel of the weapon struck the earth resulting in the blade being driven into his heart by the weight of his body. Even if Saul botched the attempt and missed his heart he would nonetheless have sustained a deeply penetrating and agonizing wound to the chest or abdomen which would have bled profusely. He falls on his sword. His armour bearer sees he is dead and then kills himself. The sequence of events flows swiftly and smoothly. There are no discontinuities, no mention of any third party being involved. The final claims I will examine are: that the Philistines killed Saul indirectly by badly wounding him in battle and preventing his escape or that the Amalekite was on the side of the Philistines. Be this as it may the Philistines did not kill Saul. He either killed himself or he was killed by an Amalekite, and even if the Amalekite was in the pay of the Philistines (for which no evidence is given) this does not make him a Philistine. Another problem with the explanations is that no sound reason is given as to why the account of Saul's death is discontinuous — we get a bit of the story here, another bit there and so on. If the authors of scripture knew what happened then the narrative would run smoothly and consistently in one unified sentence. To paraphrase what could have been said, for example: "Saul fell on his sword, but did not die from his wound. An Amalekite took pity on him and slew him out of mercy, but it is the Philistines who were ultimately responsible for his death because of their bellicose nature." In an attempt to reconcile discrepancies concerning the death of Judas Anonymous proposes that he hung himself over a cliff, that the rope broke and that he was disembowelled by a fall onto rocks. My criticism of this explanation is essentially the same as I have for the fragmentary account of Saul's death — the description is inconsistent and contradictory. In order to reconcile the various passages of scripture we have to assume without good evidence that certain events occurred when the Bible makes no mention of them, such as the noose breaking when Judas hung himself and that he did so over a cliff. Anonymous quotes Haley's reasoning: in paraphrase that Matthew doesn't deny that Judas was not disembowelled after hanging himself and that this somehow lends credence to the idea that the rope broke and that he was disembowelled as a result of the fall. But Matthew doesn't deny that Judas had two left feet, either. Can we then say that this lends credence to a claim that he had two left feet? Just because something is not denied doesn't make it true or even likely. The most probable explanation for the discrepancies, as with the case of Saul, is that there were various oral traditions concerning the death of Judas and that these were incorporated into the Bible. Concerning who purchase the field: Anonymous suggests the solution lies in applying the legal term Qui facit per alium facit per se (Latin for "He who acts through another does the act himself"}, which hinges on Haley's claim. The problem is that this legal term is specific to European commercial law (1). To attempt to connect it to a different age and culture may very well be a misapplication. In my opinion no sound evidence is given supporting the assumption that this legal term applies in this context. Therefore, the other reasoning extrapolated from this conjecture is suspect due to it being based largely on uncertain foundations. In summary the essential problem with the various attempts to reconcile the discrepancies is that Occam's Razor (2) is not being applied. Too many unproven and possibly unprovable assumptions need to be made in order to resolve the difficulties. We are expected to believe that when Saul fell on his sword he did not die (as is clearly stated) but was badly wounded, but not so badly wounded that he couldn't get up and lean on his spear even though he was having convulsions; that the Amalekite lied to David or was in the pay of the Philistines when we have no good evidence that was so; that Judas hung himself over a cliff and the rope broke and so forth and so on. authors had no clear idea of what actually happened if indeed it happened at all. Anonymous' claim that the Bible is consistent remains unproven due to lack of evidence that would enable the veracity of his postulations to be demonstrated. Mr Straughen claims the Bible contradicts itself regarding the deaths of Saul and Judas. (Investigator 177) He seems to presume that death always has a simple cause or follows from a single injury, whereas reality is more complicated. Consider elderly, frail patients who simultaneously suffer from combinations of coronary artery disease, dementia, type 2 diabetes, cancers, high blood pressure, chronic renal failure, elevated cholesterol, gastro-oesophageal regurgitation syndrome, stroke, heart failure, and chronic respiratory problems. What is true of the frail and elderly — that death is not always due to a single medical condition — would also be true in ancient warfare. Countless fighters must have died from many wounds inflicted by multiple opponents and different weapons. That is reality and the Bible reflects that reality. Regarding King Saul's death, Straughen says: "If the authors of scripture knew what happened then the narrative would run smoothly and consistently in one unified sentence." The opposite is true. If every death mentioned in the Bible ran "smoothly" like deaths in Hollywood movies it would not reflect the ambiguity of reality. Some biblical descriptions of deaths give several perspectives, and this strengthens the case for them being based on eyewitness sources. Straughen thinks it's unlikely that Saul could have stood up and leaned on his spear after falling on his sword. That would depend on the damage done and the rate of blood loss from the arrow and sword wounds. I've heard of recent people who survived five or ten knife or bullet wounds. In one instance 40 knife wounds; that victim phoned the police but died in the ambulance. The Philistines initiated the battle, Philistine arrows "badly wounded" Saul and he "fell upon" his sword to avoid captured and mistreatment. The Philistines orchestrated the situation and II Samuel 21:12 attributes responsibility with the words, "the Philistines killed Saul…" A short comment such as this by being short has to omit details. Straughen equates brevity with "contradiction" — but we can see what II Samuel 21 means by consulting the longer narrative in I Samuel 31. 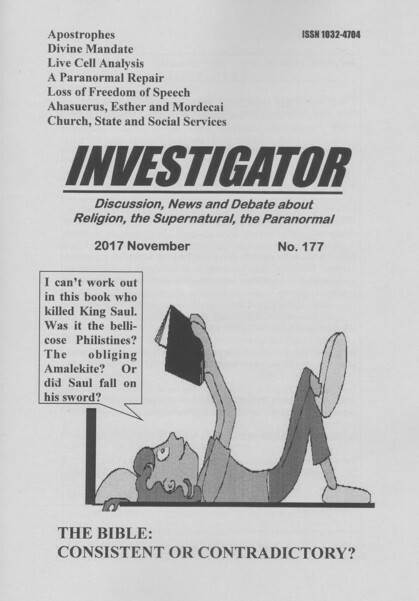 Regarding the Amalekite who claimed he killed Saul because the dying Saul so ordered him (II Samuel I), we have the possibilities that the Amalekite lied or that Saul survived falling on his sword. Unless I've missed something it's not worth further argument. The two accounts are consistent if we make the plausible assumption that the rope or branch to which it was tied broke. To prove the statements by Matthew and Peter incompatible Straughen needs to demonstrate that no one ever hangs himself or that ropes and branches never break. Haley (1992) states: "Matthew does not deny that Judas, after hanging himself, fell and burst asunder; Peter does not assert that Judas did not hang himself previous to his fall." Straughen responds, "Just because something is not denied doesn't make it true or even likely." Straughen's comment is correct but not relevant because we are not discussing the historicity of Judas' death but whether the biblical comments are consistent with each other. Haley's point is that for the statements by Matthew and Peter to be contradictory, one of them has to deny what the other stated — but neither does this. Of course, being free of contradiction does not prove that something is true (since statements can be consistent with each other yet still be false) but it's a useful start. Regarding whether the priests or Judas purchased the field with the 30 pieces of silver, Straughen queries whether a legal term specific to European commercial law is applicable. However, I gave FOUR possible explanations and Straughen can choose his preference. In his attempt to resolve Biblical discrepancies in the portrayal of the death of Saul and Judas (No. 178, pages 52-54) Anonymous suggests that sound evidence is unnecessary to determine Biblical consistency — in the conversation between the Amalekite and David, for example, because it is consistency rather than historicity that is being examined (page 53), and I am assuming his view extends to the other examples of contradictions we have discussed. However, I’m not convinced that the need for sound evidence can so easily be set aside when it comes to determining if the Bible is consistent or otherwise with regard to the aforementioned matters. There are certainly inconsistencies in the accounts of the deaths of Saul and Judas, and Anonymous has proposed a number of scenarios which attempt to harmonize these inconsistencies. For example: that Judas hanged himself and that the rope broke, which does resolve the discrepancy upon a cursory examination. However, in order for this and the other explanations to truly resolve the discrepancies, so that the contradictions are simply apparent rather than actual, what we need is sound evidence that the proposed solutions are true. If the explanations are not supported by empirical evidence then all claims of solution are unproven, and therefore the discrepancies remain. This, in my opinion, is where the matter stands at the moment. The fact that several observers have different recollections of the same scene or day or event is not necessarily proof of contradiction or error. One person might state "I observed Mr Straughen go shopping today" and another might say "I visited Mr Straughen today and saw him write for Investigator Magazine." The two observations are not contradictory since Mr Straughen might have done both. Both claims are compatible even if their historical accuracy cannot be confirmed. To check for compatibility we check the grammar and wording and whether what is described is physically possible. To check for historical accuracy we want more — perhaps, in Mr Straughen's case to prove that he went shopping, photos from security cameras would do it.